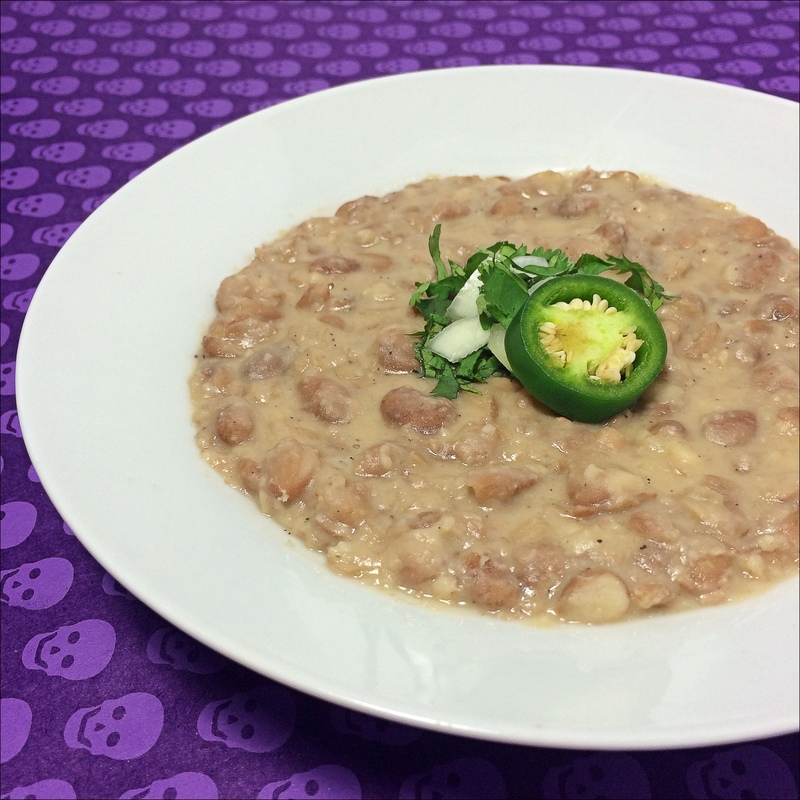 The term “refried beans” is one of those instances where a word was lost in translation. But rather than correcting the mistake, people were just like eh. Someone, somewhere at sometime screwed up. Refrito does not translate to “refried”. In spanish re means very or well. And frito, if you haven’t deduced the obvious – means fried. So, Refrito essentially means. Well-Fried. It does not mean fried again. Officer Rudy of the Translation Police reporting for duty! Truth be told, you are essentially taking cooked beans (frijoles de la Olla) and cooking them again. And therein lies the essence. Creating a whole new dish from leftovers into a new dressed up version – like adding a top hat to a tuxedo. In a perfect world Refritos would be made with fresh beans; one’s lovingly cooked from dried bean to luscious tender morsels. But sometimes you don’t have the time. And that’s okay.So. Canned Beans will do just fine. Just be sure to rinse them well and substitute the “bean broth” with a flavorful vegetable broth. The secret to mis refritos is Almond Milk (any unflavored non-dairy milk will suffice) & Nutritional yeast – they add a creaminess and umpph to the dish; it gives the beans body. File this recipe under easy-peasy-one-two-threesy. You’ll wonder why you ever bought refried beans in a can. Think of homemade refried beans from scratch as a cherry lowrider cruising down the street bumping some firme oldies. Canned Beans? That’s a 71 Pinto broken down on the side of the highway. Orale. 1. Mix together your broth ingredients in a measuring cup or bowl and set aside. 2. Melt shortening (or oil) in a rimmed saute pan or pot over medium-high heat for 1 minute or until melted. 3. Add beans and stir to mix well; cook for 2 minutes or until most of the moisture has cooked away. 4. Add broth mixture and bring to a boil; lower heat to low. 5. Using a bean (err, potato) masher, gently mash beans until most have been mashed. Scrape off any beans that have stuck to your masher into the pot. 6. Salt to taste – eat!Buen Provecho! Good Question! Yes – the water the beans were cooked in!